I got back to Medellín last night from a short, week-long trip to visit my mom. I brought back with me a Lumix LX7 and a Transcend 32GB SD card for Natalia Lopera under the auspices of the equipment delivery program. Under this program, the photographer pays the full price of the equipment, but the equipment is bought for them in the United States in order to give them access to US market prices. This saves the photographer roughly 30%, depending on the equipment. Once a local market price for the Lumix and the card have been established, I will add the money saved to the running total that the equipment delivery program has saved for young Colombia-based photographers on the donations page. 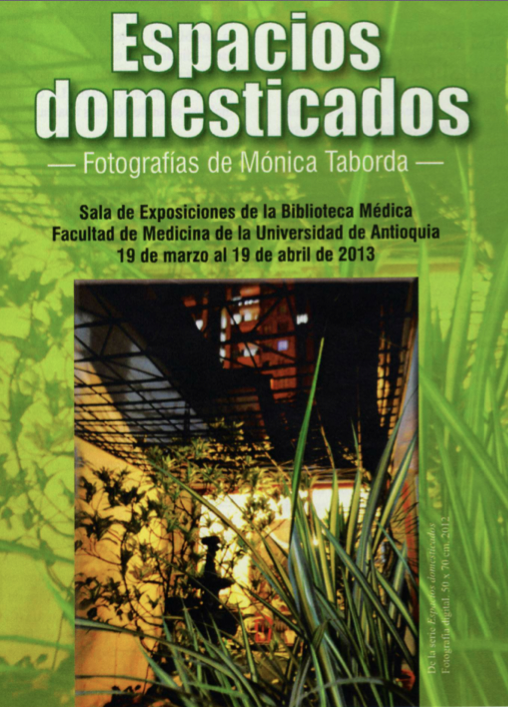 In microgrant photographer news, Mónica Lorenza Taborda - Microgrant Photographer 7 - has a show of her project Espacios domesticados at the library of the Facultad de Medicina of the Universidad de Antioquia. The flyer is above. Felicitaciones, Monica! The mentor program is currently being reorganized and will relaunch later in April and the pull-out class I teach to the microgrant photographers that live in Medellín will be this Sunday, with the goal of establishing a group portfolio to show to local exhibition spaces in hopes of organizing a show for them later in the year. Lastly, while I'm on it, the current microgrant received a donation of $2 yesterday. This is a fantastic reminder that donations of all sizes are vital for the program to be successful, smaller sizes as well as $100 donations. What's important is to contribute, if you are able and at the level you are able, in order for the program to function.